I am a huuuuuuuuuuuuuuge Muppets fan, so of course this will be the series I’ll be reviewing as it airs from now on, as Sleepy Hollow decided to go on a sophomore slump that cratered deep into the ground, along with my interest in the show. After a successful movie and a less than successful movie, the Muppets return to tv with their new series, The Muppets. It’s done in a pseudo-documentary format in the same vein of The Office, except instead of Jim and Pam (or Tim and Dawn), we got Frog and Pig! 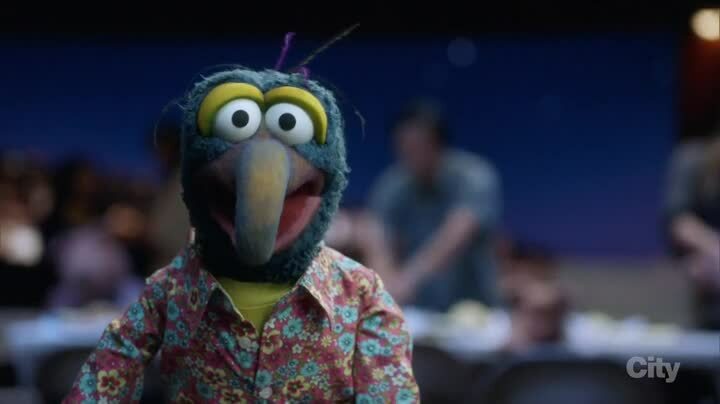 The show opens right away with the reality of Kermit and Piggy broken up, with a joke about parking beneath a picture of his ex-girlfriend. Piggy is passive aggressive or just plain aggressive to Kermit now, and their breakup history drives the plot of this episode. 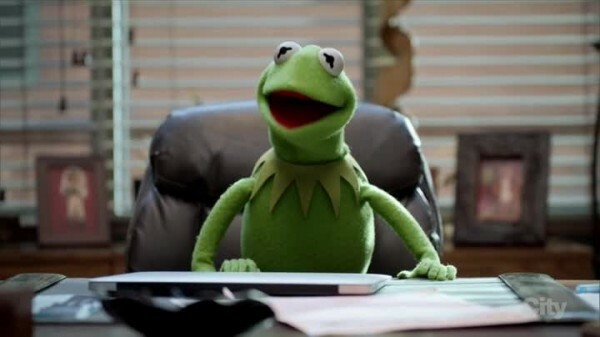 Kermit is in midlife crisis mode, with the younger girlfriend, stress eating giving him a tummy, and newfound confidence that becomes a backfiring liability with the Elizabeth Banks drama (Kermit and Piggy broke up outside a theater where her movie was playing, featuring a prominent photo of her.) 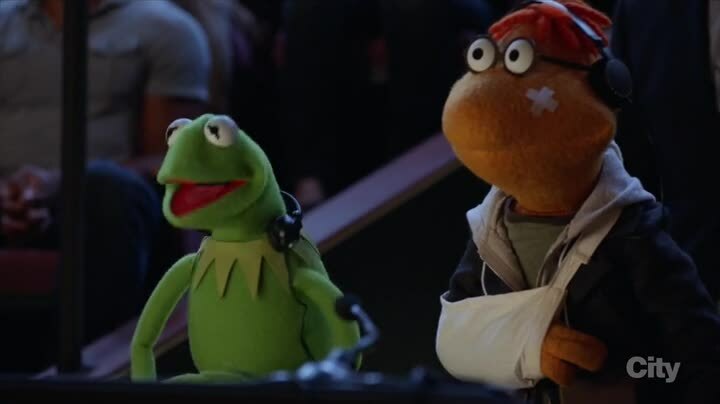 Kermit is sort of insensitive about this (as he mentions), but he can’t live his entire life working around his ex-girlfriend’s anger, can he? Actually, he should, as he’s working with her professionally and she’s a known diva. 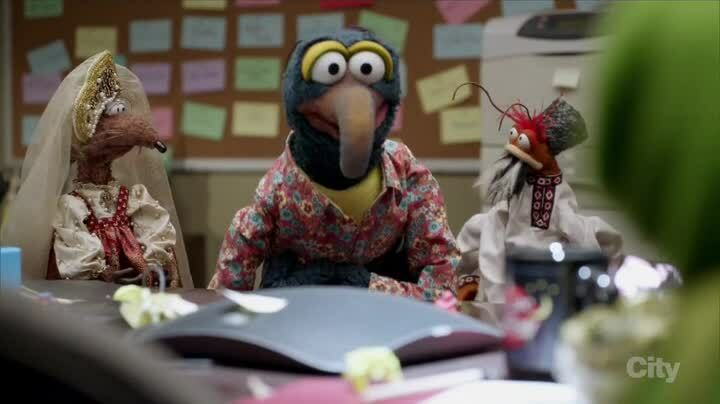 So Kermit did drop the ball here. Fozzie’s life is constant humiliation, but he’s also hit gold with a beautiful woman who loves him for who he is. Too bad her dad disapproves because he’s a bear. 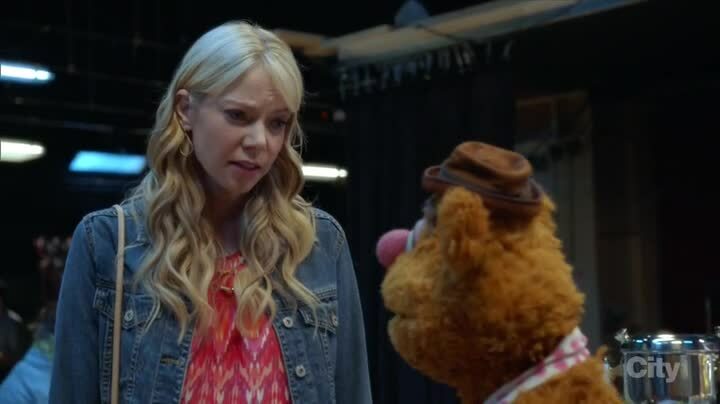 I adore Fozzie in a relationship, I hope Becky (Riki Lindhome) ends up a permanent fixture and not just a plot line where she’ll turn crazy one day. I do think the weird bear stereotypes thing was running ab it thin by the end, so hopefully they move on to a different method of disapproval if they are seen again. 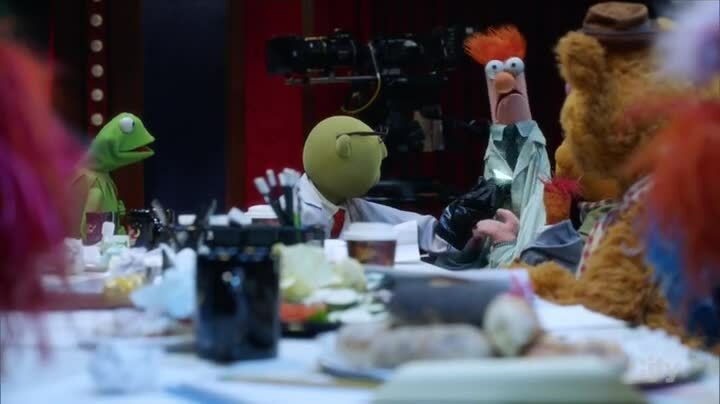 The pilot needed to set up the situations for the series, which is partially why they seem a bit rough and why the minor characters get brief lines if that. 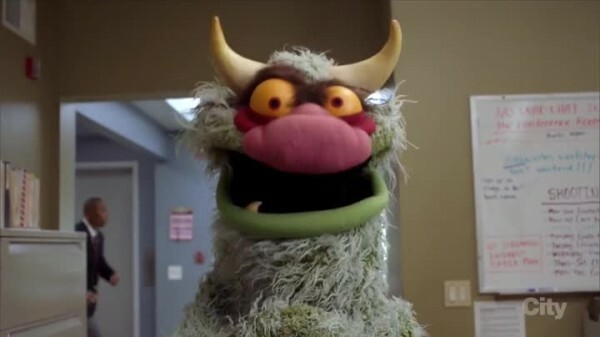 Further episodes will expand on their roles. As for the new pig Denise, daggers from my eyes at the screen is a good description. Which is weird because she didn’t do anything at all to earn my ire. 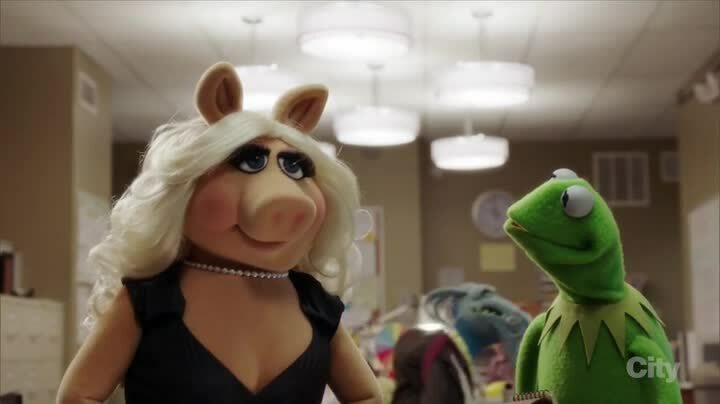 She’s just introduced as the “other pig” in the promotional material, even if in the actual in-universe plot she and Kermit started dating after Miss Piggy and him broke up. Denise is younger, thinner, nicer (so far of what we’ve seen in one episode), Southern, and encouraging of his wants and desires. I don’t know if they intend to turn her into a villainess, or if she is meant to always be sweet and nice just to twist the knife even harder. Things will get more complicated when the rumored Piggy romances start happening in a few episodes, and we’ll see how the story goes when we get there. 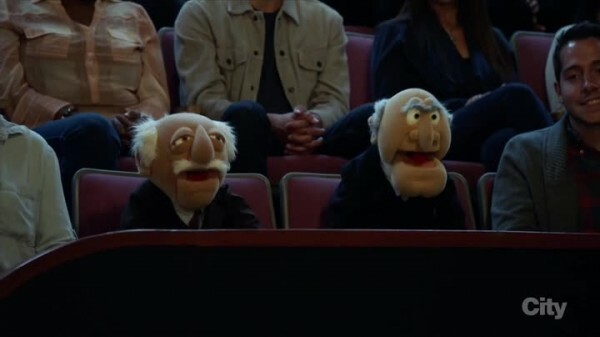 Really, the disappointing aspect of The Muppets is the characters are not on top and wild and crazy, but becoming actual three dimensional beings who aren’t all in the best of places. Kermit and Piggy’s interactions are a sad reminder of what they once were, and he mentions how without the filter of romance “she’s just a lunatic'” Piggy is obviously still upset and takes things out on everyone. 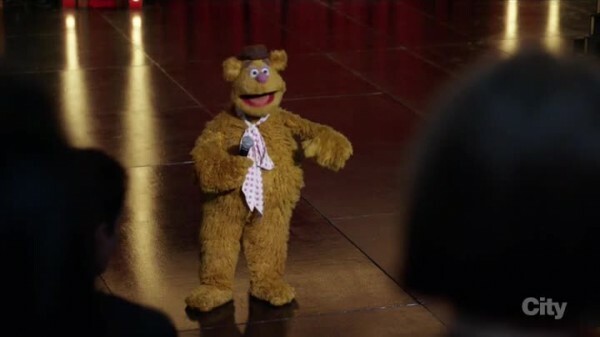 Fozzie was always the bear who couldn’t catch a break with the laughs (barring the first few appearances of him where he was more wacky confident funny), and now he has one bright spot that still has a big downside. Still parts with slapstick and ridiculous humor, and Sam the Eagle with the best lines (“Can’t say Hell”), showing there is a lot of promise. 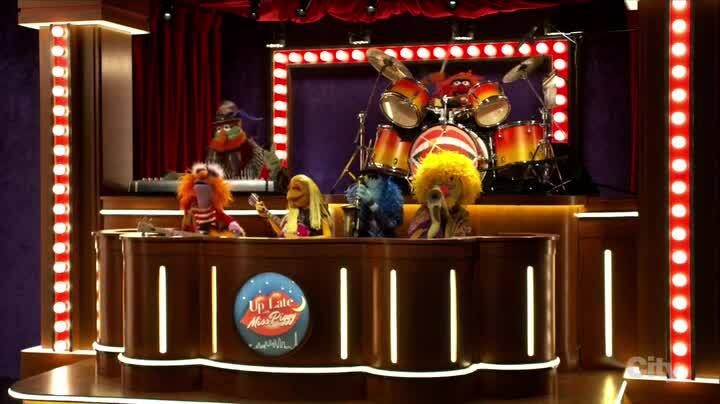 The original Muppet Show was an unknown element that took the better part of a season to find its groove with the characters, many of which were invented for the show. Here, we got established characters, but they have new jobs and life situations. 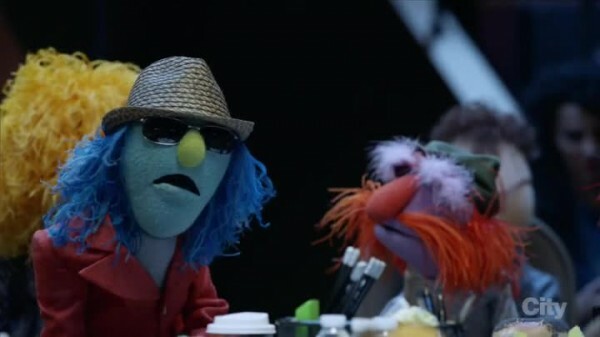 We should see the sanding of the rough edges within a few episodes, and hopefully they can find their groove and produce a product that can showcase the entertainment skit variety of the Muppets we know and love while giving up the relationship drama and behind the scenes mayhem we also crave. Hi, we’re a self-hosted site using the WordPress.org framework, so we don’t really have a follow button. You can follow the RSS feeds, sign up for email updates, or just bookmark the site. Thanks!